Whether it’s a summer barbecue, an afternoon get-together or just a lazy day in the sun, everyone loves a attractive deck. Want to add a new deck or porch to your existing home? Upgrade an existing deck? The Pro Exteriors team can design and build an amazing, comfortable area for you to entertain or simply relax. 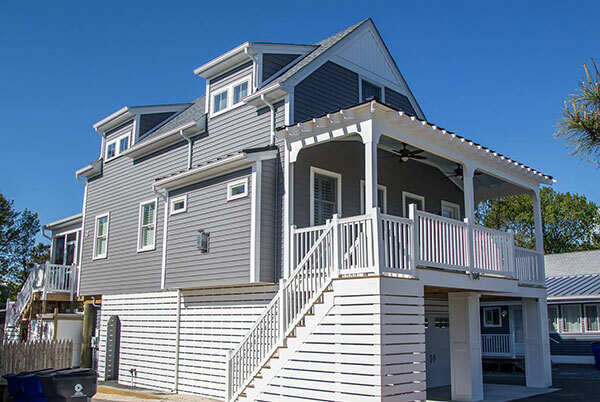 We only install decks and porches using top-quality materials that are designed and built to provide decades of strength and weather resistance. No matter what type of deck or porch you’re interested in, we have the expertise and certifications to ensure that it will be installed quickly and professionally. Many homeowners today prefer PVC, composites, and other materials that are long-lasting and virtually maintenance free. Others would request their contractors to build a deck with a more natural-looking cedar. As far as regular maintenance goes, decks and porches with wood surfaces would need to be pressure-washed and sealed once a year or so. Get Started Now. Consult Pro Exteriors. When planning a deck or porch, one major factor to consider is the use of areas and traffic. Your family would love to have an extra outdoor area that allows comfortable traffic pathways as well as enough space for the activities you all enjoy; think of having specific nooks for lounging, mingling, cooking, and dining. Start planning now and consult our experts at Pro Exteriors. Let Pro Exteriors help your home make a great first impression with a professionally installed deck. Contact us for a free estimate today by calling 302-664-1700 or completing our online quote Request Form.